In this post I’m going to share a script I wrote that speeds up the creation of Cisco MDS 9000 series SAN switch configurations. If like me you’re in the business of adding Cisco UCS Blades in bulk you will know that copying and pasting large amounts of wwpn’s and zoning can be prone to errors – let alone time consuming. Thankfully Cisco released the Cisco PowerTool pack for PowerShell for managing UCS environments; this allows easy access to extract all the necessary information needed to create our configurations quickly and consistently. The SAN that was used to demo this script contains two Cisco MDS switches with two connections a piece to SPs on an EMC VNX5300. This script should be treated as an example rather than a script that is generic enough to be run in any environment. In the below script you will notice three areas that have “#User to change as needed” comments, here you will see that I have unique values specific to my environment that will need to be edited. 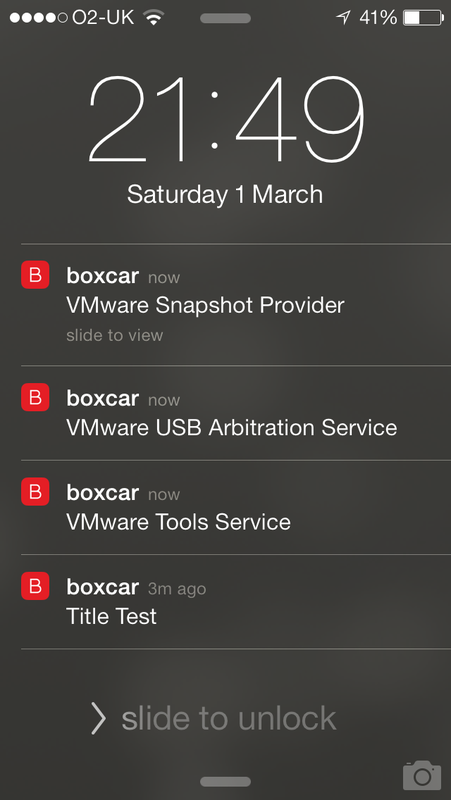 These values include my VSAN numbering, Zoneset naming and some datacentre location information. Upon running the script you will be prompted for the serviceProfilePrefix which I use to filter Service Profile Names, in my example I will use the text “PDC” which represents a collection of VMware vCloud Director Provider vDC Blades. Note: To copy the code please double click within the code box. $split = $initiator.AssignedToDn -split "/"
"fcalias name ESX_DH$($dataHall)_$($serviceProfile)_$($vHBA.vHBA) vsan $($vSAN)"
"zone name Z_ESX_DH$($dataHall)_$($serviceProfile)_$($vHBANum)_DH$($dataHall)_VNX5300 vsan $($vSAN)"
"zoneset name ZS_NDC1_$($zoneSetName)_SAN_JFRMILNER_NET vsan $($vSAN)"
As you can see in the above output the script has created fcaliases for each of the newly provisioned PDC Service Profile HBAs, created Zones and added these to the Zoneset for both my Switches. Additionally this script can be easily modified to do bulk removals as it’s just a matter of prefixing some of the configuration lines with “no” for example “no fcalias name” and “no zone name”, as this has potential of causing an APD situation I will not be providing any example of this. I hope you find this script useful and that it saves you as much time and reduces human error incidents as it has for me. As always please add a comments below and thank you for reading. This post will detail how I created a simple home automation project to control multiple power outlets using an Arduino Mega microcontroller. • Reduce the amount of systems left on standby and ultimately reduce the amount of wasted energy. • Remotely control the power state of multiple devices. • Power on and off a media server by using the Power button on the front of the computer. • Control a collection of radio frequency (RF) devices, including single sockets and power strips. • Control a couple of Power Distribution Unit’s (PDU). • Collect and present power state information via a web page that is iDevice mobile friendly. • Control all the above using a single Arduino Mega with an Arduino Wiznet Ethernet Shield. The ability to remotely manage the power states of a computer or external device over the internet can be very expensive using traditional off the shelf products, in this post I’m going to show you how I achieved this using a single Arduino. I use wireless RF and IP controlled devices for all mains power related switching so there is no risk of high voltage shocks. This project could be recreated exactly by others but I believe that it’s more likely that people will pick and choose areas of this project and implement these into their own. The code has been made available and is fairly simple to follow due to the use of functions and comments. As this is a physical computing project I decided to do a quick overview video to accompany this post. This video is best viewed in 1080p HD. To check that the operating system is up I wanted to send ping packets and report on the response, I found a ping library at http://www.blake-foster.com/projects/ICMPPing.zip. Blake created a similar project to this step and I encourage you to check out his site. This step has been covered in separate blog posts so as not to repeat myself I will provide the links below. Configure the circuit like I did in the following post, the code/sketch is similar with the most obvious change being the use of serial as input over web which I’m using in this project. Writing a web server for an Arduino is challenging mainly due to the amount of RAM available. Originally I started this project with an Arduino Uno which is limited to 2K, I maxed this out almost immediately* so I decided to get an Arduino Mega with 8k of RAM. 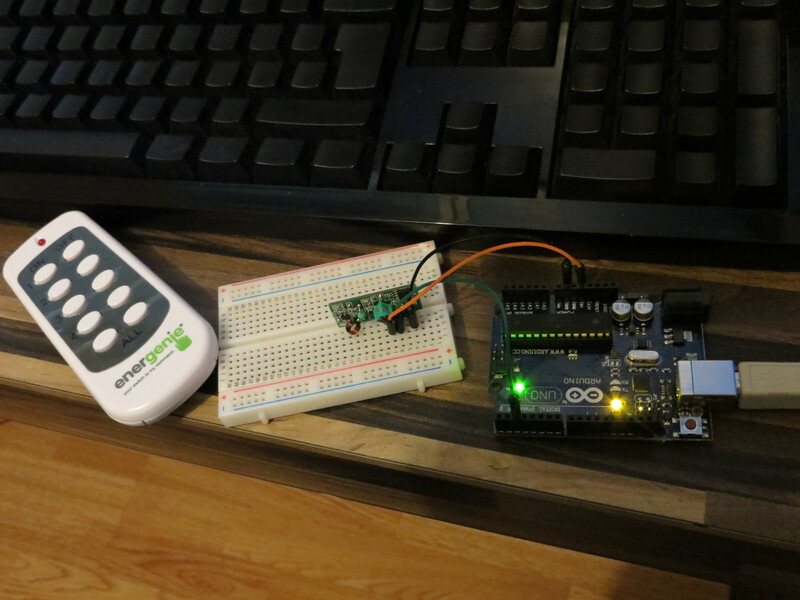 Using the Simple Web Server sketch provided in the Arduino IDE as the starting point I created an HTML table to display the power buttons of the Energenie power strip, this code used up a lot of the available RAM. When I started to add further table rows I soon realised that I would not be able to fit the desired 21 I needed using this format. The solution I used is to have the unique information about these devices within an array and then loop through them to build the page for each client request. This made the code a little more complex but allowed massive reductions in the amount of code I needed to store within RAM. Using the original web portal interface for the IP PDUs it required multiple actions to change a power state which I didn’t want and as I have two PDUs I needed to log into each one individually. This should not be considered as a design issue with the devices it’s just that they were not designed for such frequent use or outside a server cabinet for that matter! It basically resizes the table to fit to the mobile devices landscape screen resolution and works well on all my iDevices. This code queries the current power state of the PDUs and stores the results in an array for use by the aforementioned HTML table loops. This code actions PDU power state change requests. This code uses the above two functions to action the HTML button pushes. You will also notice that this sets the refreshRequired variable, this is used to force the client back to the webservers root directory and allow the changes of power states to be show on the page. I found that redirecting the users back to the root also prevented the refresh button on a browser sending an additional GET request to an already completed request. At the time of writing this blog post I only have a single Set as listed on the above image as “Set – 1” but I have plans to add several more. Sets allow me change the power state on multiple devices at once even if they differ power source and/or control method. I have used this to power on my desktop computer and all associated monitors, this is shown in the demo video which accompanies this post. 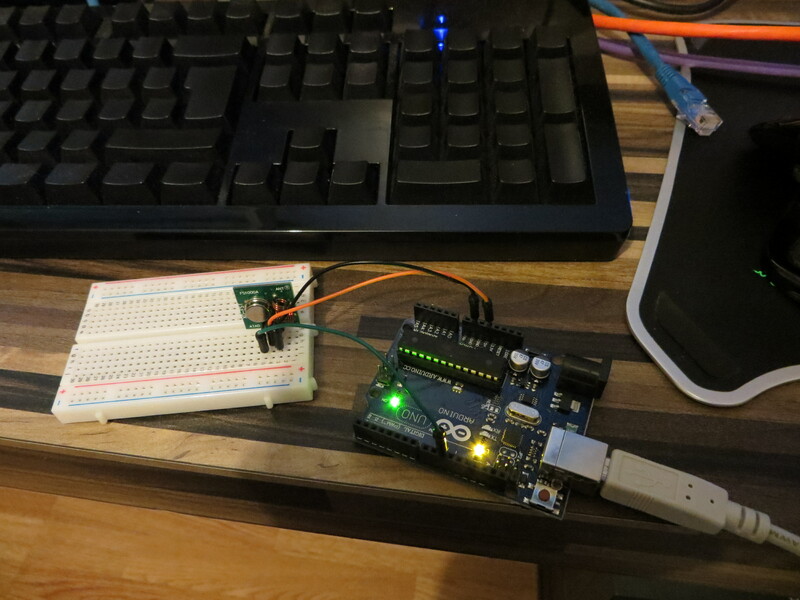 I have controlled access to the Arduino web server using the firewall on my router. This has allowed me to restrict access to my place of work and my internal LAN only. Well I hope you’ve enjoyed reading about this project as much as I enjoyed putting it together. Please use any of the ideas and code in your own projects but please do give credit to the original author. Today I found myself in a situation where I needed to enter a product key and then activate several Windows 2008 R2 Servers, this would be a real chore if I had to use the GUI. A quick internet search brought me to slmgr.vbs a great little script that has been included with Windows since Vista/2008 and it even works remotely. Looking at the options on the TechNet page you can see that a simple “slmgr.vbs ServerName -ipk “AAAAA-BBBBB-CCCCC-DDDDD-EEEEE””(Replace the latter with a valid product key) would sort the product key task out for me. To activate and complete the task I would need to use with the following command “slmgr.vbs ServerName –ato”, simple. This allows you to paste back into the console and execute your commands. Admittedly this is a little quick and dirty and could do with some error checking but it got the job done and saved me a couple of hours work, hopefully it will save others time as well. 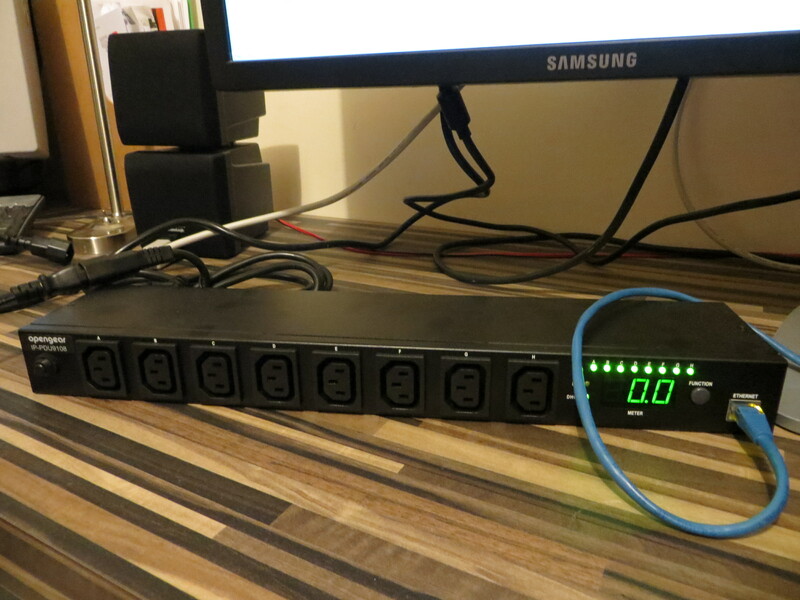 This month I managed to get my hands on an Opengear IP-PDU 9108 8 Port Switched & Metered PDU http://www.opengear.com/product-ip-pdu.html which seems to be a rebranded http://www.digipower.com.tw/PDU/BravoPDUswitched.htm. 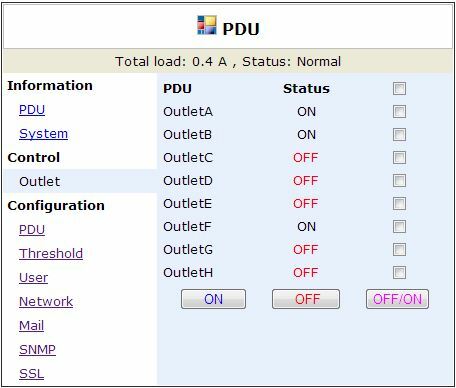 The PDU can be controlled over the network using a web interface or SNMP. Digipower have an online demo available on the following link http://www.digipower.com.tw/PDU/BravoPDUswitched.htm, at the time of writing this post the address was http://211.75.143.21:8080 (snmp:1234). I’ll demo my code against this test system and if you want to test the code is a safe environment this could be useful for you. Why bother if you have web and SNMP access? 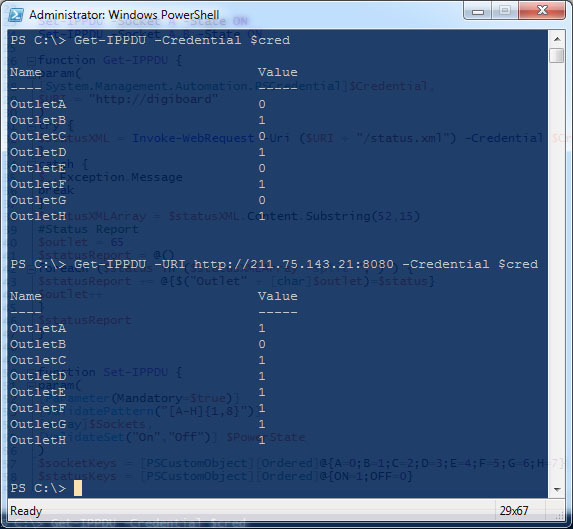 Well I wanted to do this with native PowerShell cmdlets so that ruled out SNMP and to be quite honest the web portal is great for setting up the main configuration but a bit too long winded to turn a single socket on and off, or get a quick outlet status report. I also wanted to do this with web requests to that I could later use the same techniques learned for this post with an Arduino project I have on my to-do list. Jackpot, now I needed to find where in that long response the actual statuses of each of the outlets were. I thought the best to make them stand out was to set them alternate e.g. This pattern was easy to spot and just to make things as clear as possible for this post I’ve bolded and underlined the areas of interest. That wraps up the Status.xml, now onto turning the outlets on and off. I would guess that the second block of 8 numbers is for 16 outlet PDU’s but I cannot be sure. This provides a couple of parameters, URI and Credentials, both are self-explanatory. Here is a screenshot of me trying this against the one on my LAN and the one from the demo site mentioned earlier. We have both the URI and Credentials parameters like the Get-IPPDU function, I also added “Outlets” which accepts the letter name of the Outlet or a comma separated collection of outlet letters and finally the PowerState which accepts On or Off. 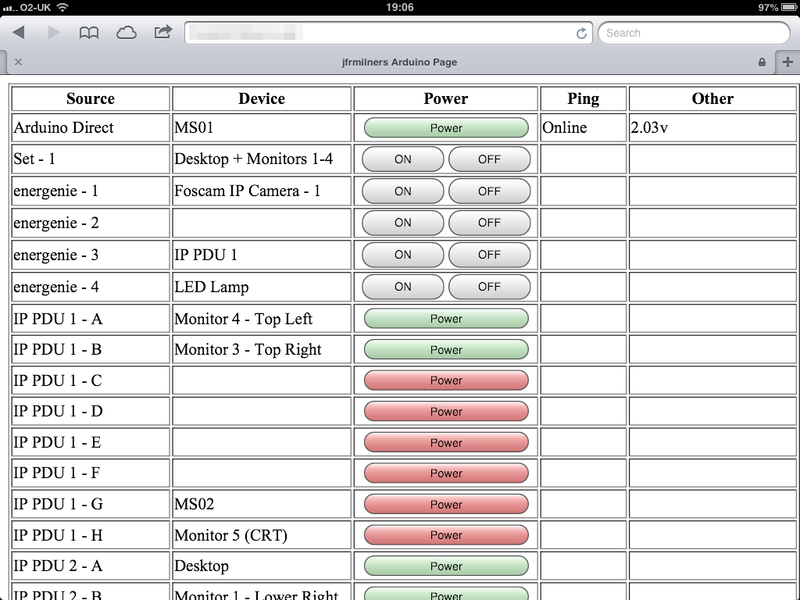 Here is a screenshot of me testing the functions against the IP PDU on my LAN. 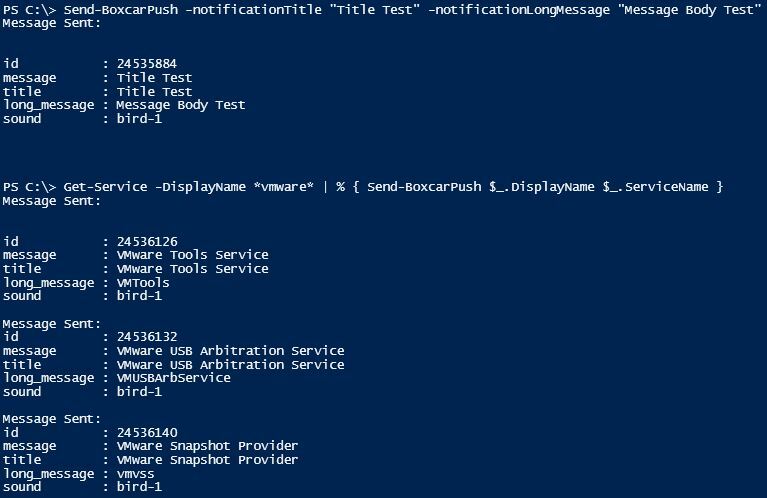 I think this is another great example of the power of the new PowerShell 3 Invoke-WebRequest cmdlet and an interesting way to get PowerShell interacting with system/hardware it was never intended for. These functions should work with any of the digipower PDU’s, such as the Amazing PDU and Bravo PDU. Thanks for reading and as always your comments are welcome. 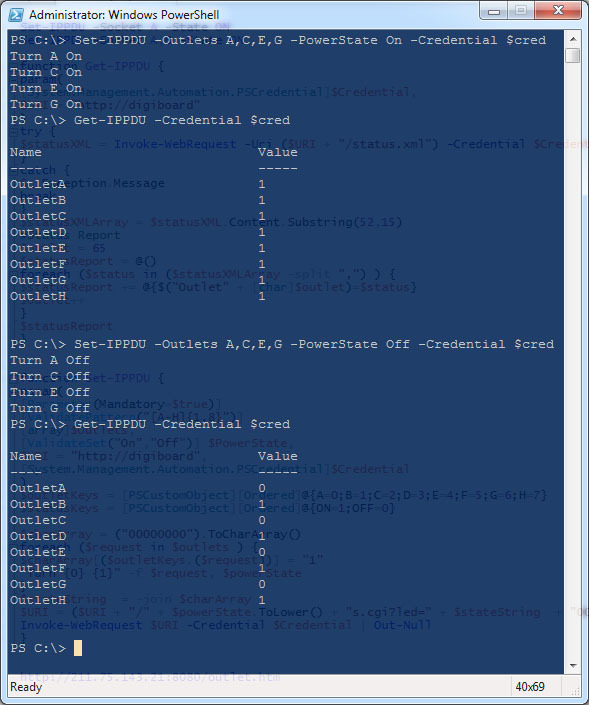 So to summarize we have collected all the RF codes for my Energenie Power Strip, created a Sketch on an Arduino connected to a an RF transmitter the only thing left it to use PowerShell to send Serial commands. This is one of those moments when an image fails to express the sheer excitement of a lamp going on and off! Program some keyboard shortcuts to power the sockets on and off. Create a web front end and on that note I should point out that Energenie have another solution the LAN Power Management System available, this would be an easier solution for the none techie folks. Anyways, thanks for reading my posts and I hope you enjoyed Powering Power Sockets with PowerShell as much as I did! Continuing on from the previous post where we collect all the RF codes for my Energenie Power Strip we will disassemble the receive circuit and build one for RF transmission. My sketch below is a modified version of the “Examples > RCSwitch > SendDemo” Sketch included with the library. Basically the Arduino listens on the Serial port for a byte and if one is found it will check for a matching if statement and actions that code block. Each if statement has been configured for one of the ten possible codes captured earlier and also set to send back a confirmation of which code block was ran, the latter is useful for debugging. Once the Sketch has been uploaded to your Arduino you could use the Serial Monitor to send one of the numbers or any serial aware software for that matter but if you read on to part 3 I will demonstrate doing this with an advanced PowerShell function. In this post I’m going to try something a little different, I’m going to explain the process I used to control a four gang power socket with PowerShell. Now I’m only going to be sending serial commands with PowerShell as the hard work is being done by an Arduino and the “rc-switch” library but still this was a really fun project to do and one I wanted to share! Like I mentioned in the intro we will be using the “rc-switch” library which can be downloaded from http://code.google.com/p/rc-switch/. Add this to your \arduino-1.0.1-windows\arduino-1.0.1\libraries\ directory and open the Arduino IDE. Now open the “ReceiveDemo_Simple” sketch and upload this to your Arduino.